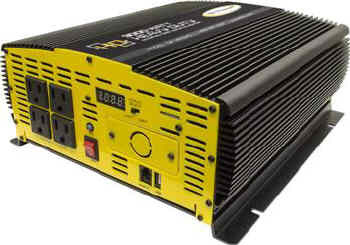 The largest Go Power!™ modified sine wave inverter, the Go Power! GP-3000HD provides enough power to run several appliances at once. With a 3000-watt output, the GP-3000HD is the best choice for most large power requirements. Plug your appliances directly into the unit's two AC outlets, or wire the GP-3000HD into your electrical system using the optional Go Power! transfer switch. Features include full overload protection, LED display and optional remote.